My work explores the use of colour in the clay itself and not as surface decoration. Simplicity of form is pre-eminent, but the form itself varies: ceramic pieces such as bowls, dishes and towers, but also jewellery, buttons, windchime mobiles, and even dolls’ house scale miniatures. 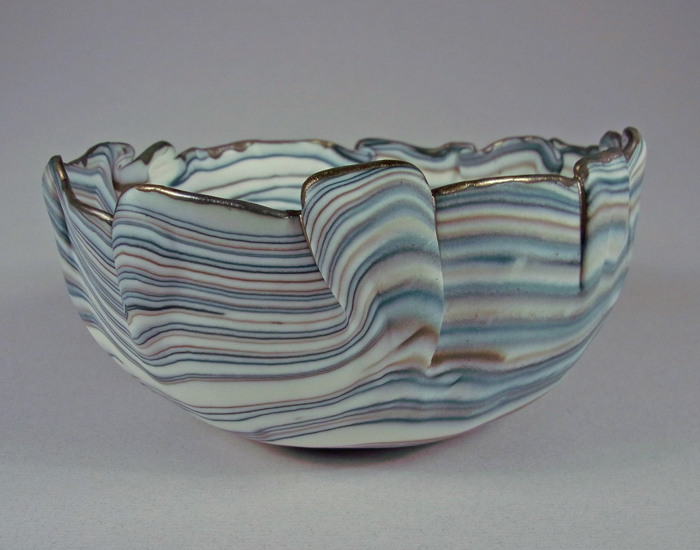 My porcelain agateware is a contemporary use of a traditional technique. Instead of mixing clays of differing colours, I work in porcelain alone: colouring some and then mixing the colours to create my patterns. I enjoy this combination of part control and part happenstance. I decide the colours, the quantity of colour, and create the patterning, but then a random element takes over – beyond my control. The work is made in a series, but no two pieces will be identical. Only the rims are glazed. Once-fired in an electric kiln.